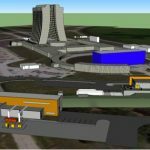 NOTE: Fermilab and Brookhaven Lab staff will be covering the move with photos and video, and will make all materials available for news organizations. Contact Andre Salles (asalles@fnal.gov) or Peter Genzer (genzer@bnl.gov). Up-to-date information will be posted at muon-g-2.fnal.gov. Scientists from 26 institutions around the world are planning a new experiment that could open the doors to new realms of particle physics. 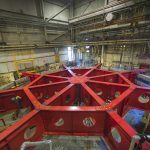 But first, they have to bring the core of this experiment, a complex electromagnet that spans 50 feet in diameter, from the U.S. Department of Energy’s Brookhaven National Laboratory in New York to the DOE’s Fermi National Accelerator Laboratory in Illinois. The experiment is called Muon g-2 (pronounced gee-minus-two), and will study the properties of muons, tiny subatomic particles that exist for only 2.2 millionths of a second. 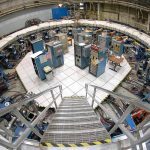 The core of the experiment is a machine built at Brookhaven in the 1990s, and the centerpiece of that machine is a circular electromagnet made of steel and aluminum, 50 feet wide, with superconducting cable inside. While most of the machine can be disassembled and brought to Fermilab in trucks, the massive electromagnet must be transported in one piece. It also cannot tilt or twist more than a few degrees, or the complex wiring inside will be irreparably damaged. 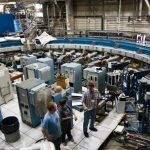 The Muon g-2 team has devised a plan to make the 3,200-mile journey that involves loading the ring onto a specially prepared barge and bringing it down the East Coast, around the tip of Florida and up the Mississippi River to Illinois. The ring is expected to leave New York in early June, and land in Illinois in late July. 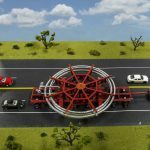 Once it arrives, the ring will be placed onto a truck built just for this purpose, and driven to Fermilab in Batavia, a suburb of Chicago. The land transport portions on both the New York and Illinois ends of the trip will occur at night — to minimize traffic delays — and the truck will only travel, at most, 10 miles per hour. 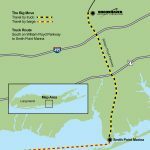 On the New York end, the trip from Brookhaven Lab’s gate to the departure port should take one night. The complete trip from the Illinois port to Fermilab should take two consecutive nights. Once at Fermilab, the storage ring will be used to hold muons created in the laboratory’s accelerators. Muons “wobble” when placed in a magnetic field, and based on what we know about the universe, scientists have predicted the exact value of that wobble. An experiment using the same machine at Brookhaven in the 1990s saw evidence for – though not definitive proof of – a departure from that expected value. The experiment is scheduled to begin taking data in 2016. One of ten national laboratories overseen and primarily funded by the Office of Science of the U.S. Department of Energy (DOE), Brookhaven National Laboratory conducts research in the physical, biomedical, and environmental sciences, as well as in energy technologies and national security. Brookhaven Lab also builds and operates major scientific facilities available to university, industry and government researchers. Brookhaven is operated and managed for DOE’s Office of Science by Brookhaven Science Associates, a company founded by the Research Foundation for the State University of New York on behalf of Stony Brook University, the largest academic user of Laboratory facilities, and Battelle, a nonprofit applied science and technology organization.